The constellation Hercules. Roll mouse over to see labels. 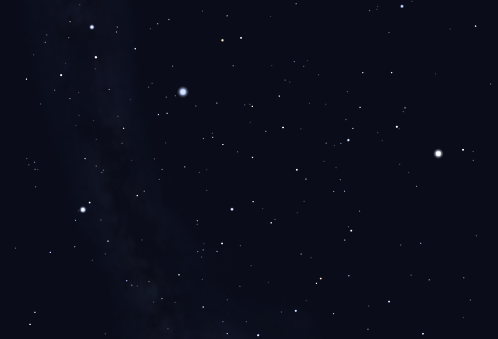 Hercules is a large northern constellation, culminating at midnight in May. It has the fifth largest area of all the constellations. Despite this, it covers a rather dark area of the sky and has only two stars brighter than third magnitude. It is best known for its deep sky offerings, which include M13, often known as the ‘Great Globular Cluster in Hercules’. M13 is the brightest globular cluster to lie at a high northern declination. It is also home to another bright globular cluster, M92, as well as the much fainter cluster NGC 6229. The name ‘Hercules’ is Latinised name for the Greek hero Heracles. The constellation is probably much older than any association with Hercules: in the third century BC, Aratus referred to the constellation as depicting a nameless man, but a century later, Eratosthenes identified him as Heracles. The figure is usually drawn with his foot on the head of the dragon Draco, which is appropriate as one of the labors of Hercules was to slay the dragon which guarded the golden apples which grew in the garden of Hera. Hercules contains the following Messier objects: M13, M92. 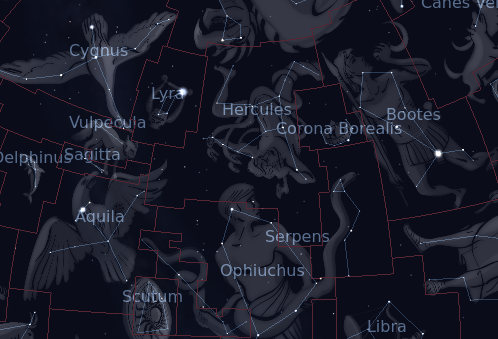 The following constellations neighbor Hercules: Aquila, Bootes, Corona Borealis, Draco, Lyra, Ophiuchus, Sagitta, Serpens Caput, Vulpecula.